Sri Lanka’s export earnings may rise as much as $7 billion because of the refinery. A Singapore-based company and the government of Oman have pledged to build a $3.9 billion oil refinery next to a Chinese-controlled port in what will be the largest foreign investment ever for the Indian Ocean island nation, officials said on Tuesday. The refinery will be a joint venture for the Singapore-based Silver Park International Private Limited firm and the Sultanate of Oman’s Ministry of Oil and Gas, said Nalin Bandara, Sri Lanka’s deputy minister of international trade. Construction will begin next week and the refinery is expected to be up and running in 2023, he said. “This is the biggest foreign investment in the country’s history,” Bandara told reporters in the capital Colombo. The refinery will produce 200,000 barrels per day, mainly for export, though Sri Lankan companies could place orders for refined products and sell them to local consumers. The refinery and a tank farm will be built on 237 hectares (585 acres) of land lying about 235 kilometers (146 miles) south of Colombo, near the Hambantota port that is controlled by a Chinese firm. 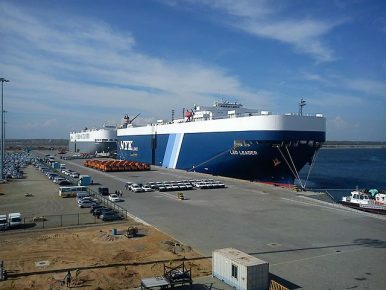 Sri Lanka leased the Chinese-built port located near the planet’s busiest east-west shipping route — to a Chinese firm in 2017 for 99 years in a bid to recover from the heavy burden of repaying a loan obtained the country received to build the facility. China’s influence in Sri Lanka makes neighboring India anxious because it considers the Indian Ocean region to be its strategic backyard. Sri Lankan government has been trying to balance both Asian giants. Sri Lankan officials have reiterated that the port’s security will be handled by the government in an attempt to allay fears that the port could be used by China as a military hub. Bandara said Silver Park has 70 per cent stake in the joint venture, while Oman controls 30 percent. The investment comes as Sri Lanka struggles to repay $5.9 billion in foreign loans this year, of which 40 percent that must be serviced by the end of this month. The country used its reserves to repay a $1 billion sovereign bond loan in January. Sri Lanka’s export earnings are expected to rise $7 billion because of the refinery, Bandara said. By Bharatha Mallawarachi for the Associated Press. The Sri Lankan government has given assurances that the port will not be used for military ends.